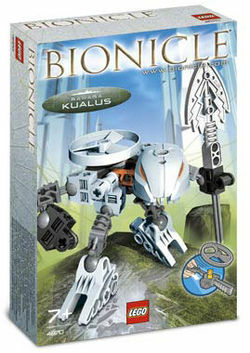 4870 Rahaga Kualus is a BIONICLE set released in 2005. It comes with a white Rhotuka Spinner, a Rhotuka Launcher, Kualus himself, and his staff. He was one of the six Rahaga released. He was originally a Toa Hagah, but a set of his Toa form was never released. This is a description taken from LEGO.com. Please do not modify it. (see an archive of the product's page) Master of winged Rahi! New feature! Pull the ripcord to send the Rhotuka spinner flying. Add #4868 & #4869 to this set to build a Rahi Ice Vermin! His head and weapon are the same as those of the Rahkshi Kurahk. Facts about "4870 Rahaga Kualus"